Financial planning is an ongoing process that helps you make sound, unemotional decisions about your money that will help you reach your financial goals. It involves long-term planning with the aim of growing your investments while also minimizing your expenses. Financial planning is really thinking about all of the financial aspects of your life. These include your retirement, ensuring your family is provided for if you die, protecting your assets, and so on. Then, creating a strategy that ensures each item is taken care of. That strategy is your financial plan. Identify what your goals are in the short, medium and long terms. Create a road map that will help you move from your present financial situation to where you want to be in the long term. Then monitor and adjust your plan on a yearly basis. 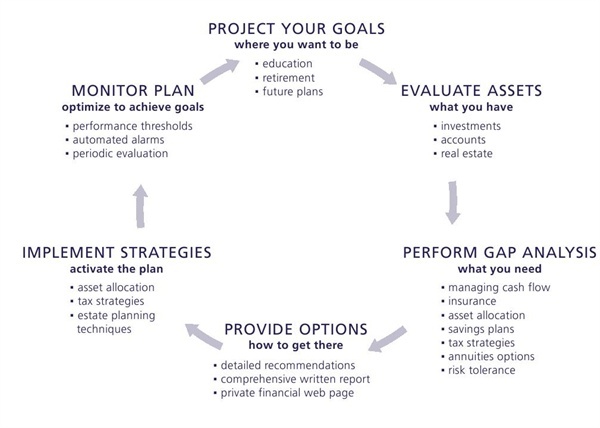 At the Center for Wealth Management, we start by helping you identify your goals. These are things like where do you see yourself financially in the future, when do you want to retire and what does that retirement look like to you? Then we evaluate where you are relative to those goals. This is like taking a snapshot of your current financial state. Once we have that snapshot, we begin to evaluate your options to help you reach those goals and will recommend strategies to help get you where you want to be. But we don’t stop there. We help you implement the recommendations. Then, we continually monitor your financial situation to ensure you remain on track towards your financial dreams. Want to learn more about Estate Planning? Call us at (513) 407-5430.